Thoughts on Education Policy: Redux: Is Education Spending Really Skyrocketing? Redux: Is Education Spending Really Skyrocketing? Back in the spring I wrote a piece on the trajectory of school spending in the United States. Unfortunately, I later realized (and Sherman Dorn later pointed out) that my graph was fatally flawed. I compared per-pupil expenditures to GDP when what I really meant to do was compare per-pupil expenditures to GDP per capita. I finally found that data and took some time to make some colorful graphs, so here's what I've found. Before I get to the graphs, let me back up for a second. Nobody disputes that expenditures on education have risen quite dramatically in real dollars over the past century in the United States. But I'm not sure that's the most appropriate statistic at which to look b/c there's no context. Just as people would expect to spend different amounts on food or housing depending on their income, a country would expect to spend different amounts on education depending on their wealth. In other words: you'd expect the U.S. to spend more on education than Somalia because the U.S. has more money to spend. Similarly, you'd expect the U.S. to spend more now than in 1930 b/c the U.S. now has more money to spend. So the question shouldn't be "how much more do we spend on education now?" it should be "how much more should we spend on education now?" Before anybody gets up in arms, I am not arguing that we should expand education funding ad infinitum. It's clear that wealthier countries can spend more on education than can poorer countries, but at what point has a country spent enough? One way of visualizing this is to compare education spending to overall wealth. Before reading the graphs below, ask yourself this question: as a country grows wealtheir, should the percentage of wealth spent on education increase, decrease, or stay constant? Your answer to this question is largely dependent on how you view education. If education is a necessity, like food, then the percentage of resources that one devotes to it would decline as one grows wealthier. If it's a luxury item, like vacations, then the percentage of resources that one devotes to it would increase as one grows wealthier. In the former case, money spent on education would be a non-negotiable essential; in the former, one would first pay for the essentials and then use disposable income to pay for education. I would argue some combination of all of the above. It might be easier if I drew this on a graph, but I already have too many graphs so I'm just going to try and explain it. Some level of schooling is practically essential for a country. As far as I know every country in the world has some sort of schooling -- even if it's 100 kids and one teacher in a ramshackle schoolhouse withone textbook to share. So some portion of a country's resources should be devoted to education no matter what. Schooling beyond the bare bones is more of a luxury item -- on which countries should spend their disposable income. In other words, before building sprawling campuses with swimming pools, LCD projectors, etc. a country would make sure that is has already covered the costs of basic infrastructure and security. And at some point the marginal returns to education spending would start to decline rapidly -- at which point that country would probably want to stop raising spending in absolute dollars (meaning that it would fall as a percentage of wealth). In other words, poor countries should devote an ever growing share of their resources to education as they grow wealthier, middle-income countries should devote about the same percentage of resources as they grow wealthier, and at some undetermined points the wealthiest countries should start devoting a smaller share of their resources. It's probably easier to understand if we use a family as an analogy for a country. A very poor family will make sure that their child goes to school and try to provide that child with some basic supplies -- pencils, notebooks, etc. As the family grows wealthier they have more disposable income and can afford to buy the child books, magazines, fancy binders, perhaps an extra tutoring session, etc. As the family grows wealthier still they might choose to spend a condsiderable portion of their disposable income on sending the child to a private school. But at some point there's really not much more that the family can do for their child by spending more on their education -- the child is enrolled in the best private school, has a top-notch laptop with expensive software, individual tutors for all subjects, attends elite academic summer camps, etc. So the family may grow even wealthier, but that additional wealth would be devoted toward things other than education b/c they've maxed out their ability to aid the education of their child. If I've just wasted this space trying to explain and it still doesn't make sense then somebody let me know and I'll make a follow-up post with a graph and more concise explanation. All graphs show spending in constant dollars -- meaning that lines do not increase due to inflation. 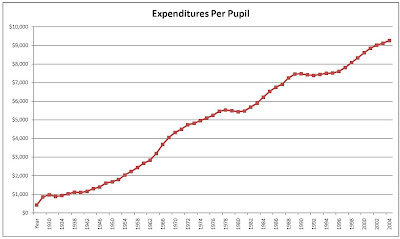 Graph 1 shows per-pupil expenditures in the U.S. since 1930 -- you'll see why I said that nobody disputes that the rise has been dramatic. 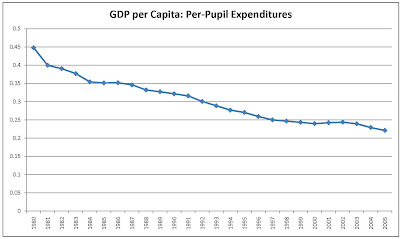 Graph 2 shows the trend in the ratio between GDP per capita and per-pupil expenditures since 1980. 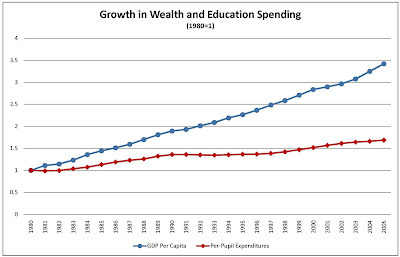 Graph 3 shows the comparison in growth between GDP per capita and per-pupil expenditures since 1980. You can see larger versions of the graphs by clicking on them. So, while education spending in the U.S. appears to have skyrocketed over the past 85 years, it has actually shrunk as a ratio of wealth over the past 25. As you can see in graph 3, real per-pupil expenditures almost doubled between 1980 and 2005, but real per capita GDP nearly quadrupled during that same timespan (I'd really like to get GDP per capita back to 1930, but haven't found it that far back -- if anybody can help me out with that then let me know). In other words, even though we're spending more money on eduation we're spending a lower percentage of our wealth on education. As I argued before, that's not necessarily a bad thing: at some point more spending on education stops helping. So the question is, are we at that point? A few years ago, I was on a panel at a national conference on teacher effectiveness. One of the other panelists was trying to make the point that education expenditures (including teacher salaries) continued to rise, but we weren't getting better results from the increase in expenditures. Finally, he said "Education costs have tripled since 1975! Tripled!" I was a new teacher in 1975, and I bought my first new car that year--a Toyota Corolla, for which I paid slightly less than $4000. (I'm clear on that, because it was also my first loan.) In 2005, a new Corolla (basic, no frills) cost about $14,000. The items that didn't triple in price quadrupled. Americans are not known for their belief in long-term investment in knowledge and personnel, but you can often get them to pay for stuff. I live in a district that voted to build a new $70 million high school, which now sits empty because there are not enough operating funds. Sure looks nice when you drive by, however. This is amazing to see because I just got my property tax bill and 9o% of my taxes go to the school district. I think there needs to be better handling of the money that they do get. Great report! I appreciated the insight and research. I've been one of those on the complaining end of "spending increases while achievement stagnates", and this was very insightful for me. Nancy's comment was spot on too. What to do about Teacher Certification? Do Unions Place Adults Before Children?